Photo booths are a great way to encourage guests to interact and have fun at events, but there are more ways that your business can benefit from a photo booth than event entertainment. For one-time events, renting a photo booth is the perfect party-planning solution, capturing memories and engaging guests in a fun and fuss-free way. But wouldn’t it be nice to have a permanent on-site photo booth that provided ongoing fun for your customers while boosting profits for your business? 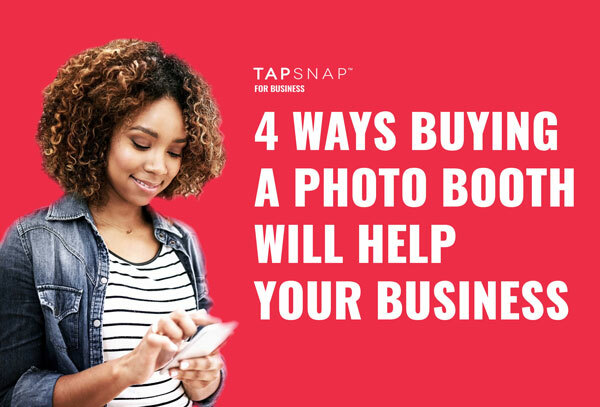 We’ve created TapSnap for Business for companies who want to enjoy the benefits of a permanent photo booth all year long, with industry-specific solutions designed to suit your needs. Our permanent installation kiosks will help you to retain and attract customers, increase brand awareness, and grow your business in a fun and engaging way. Why buy a booth for your business? You can boost your brand with a customized photo booth. Our photo kiosks are 100% customizable, allowing you to brand your booth to suit the needs of your business. Whether you’re looking to increase brand awareness through eye-catching creative that will encourage your customers to tap, snap and share, or you’re looking for a new revenue-generating opportunity for your partners, our customized kiosks will work for you. You can tap into social sharing, increasing your organic reach online. Whether they’re on vacation, at a party, or just killing time, people love to snap and share photos. Providing them with the perfect platform to create high-quality customizable pictures that can be easily shared to their social media platforms with one tap, will give your brand limitless organic reach online. Like with word-of-mouth marketing, your potential customers will trust your existing ones - a great way to attract new guests. You can collect data for future marketing efforts. As your customers tap, snap and share, you will collect data on who they are, and have assets on-hand to communicate with them after their photo booth experience. Not only can you provide reports on the ROI of your booth, but you can use your data for future marketing and sponsorship opportunities. You can create a new stream of revenue. Your photo kiosk comes fully-equipped with a range of revenue-generating opportunities.You can sell ad space on the kiosk skin, kiosk screen, photo frame, digital background, and email template, and even brand digital props. With our online user interface, changing up logos and graphics is simple and easy. Whether you’re a small retail store looking to increase foot traffic, or a sports arena looking for new way to engage fans, TapSnap for Business has a solution fit for your needs. Check out our new website and let us help you grow your business.